Nuclear Shutdown News chronicles the decline and fall of the nuclear power industry, both in the US and worldwide, and highlights the efforts of those who are working to create a nuclear free future. This story starts with a clandestine dinner in Warsaw, Poland. Present are Michael Peevey, president of the California Public Utility Commission, and Stephen Pickett, a high ranking official with Southern California Edison, a major electrical utility. It is March 2013, the same month SCE announced the unexpected permanent shutdown of its San Onofre Nuclear Power Station. No nukers were elated. But their joy later turns to disappointment and then outrage when the CPUC subsequently hands down a decision that leaves us on the hook for billions of dollars in costs supposedly related to the shutdown of San Onofre. How did this happen, and so relatively quickly? But this year evidence has been mounting of corruption and collusion between CPUC and SCE officials that, unless reversed, will leave San Onofre customers holding the bag for monstrous bills that will take generations to pay off. The only question is how many billions od dollars are at stake in this gargantuan ratepayer ripoff. After that little dinner party in Warsaw, the CPUC, with Michael Peevey still at its president, handed San Onofre’s customers a $4+ billion bill. Allegedly Peevey and SCEd’s Stephen Pickett concocted this “deal” along with their after dinner mints in Poland. In an August 3 report, KPBS San Diego reported the total charge could skyrocket as high as $10.4 billion. Peevey subsequently resigned from the CPUC. TV 7 also reported the judge ordered Edison to show cause why it should not be held in contempt of court. working it to the tune of multi-billion ratepayer shakedowns until their grandchildren are grown, that is. 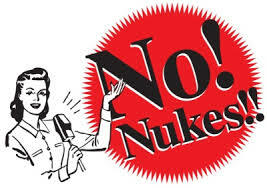 San Clemente Greens and other environmental groups like Friends of the Earth pointed out the rapid failure of the new steam generators, key components in nuclear power reactors, rendered San Onofre unsafe and in need of immediate permanent shutdown. The junk stem generators pricetag was $680 million, another cost the utility wants to stick its ratepayers with. It is noteworthy that minutes prior to this hearing, Peevey had been meeting secretly with Edison’s top brass in yet another unlawful ex parte hearing.